Automatic gate openers provide a way to secure your home and make it more convenient for you to still have access to your property. One of the known producers of various models of gate openers is the ALEKO Company. Even if you limit your choice to what the ALEKO brand offers, there are still different models to choose from and it can be confusing to choose one. In this ALEKO gate opener review, we discuss a few of the best-selling models as well as how to choose the best one for your gate. The ALEKO AC1400 Electric Sliding Gate Opener has a 1.5-HP motor that is capable of sliding a gate which has a length of up to 50’ and a weight of up to 1,400 lbs. Although it can be challenging to install, once successfully installed, it will move the gate smoothly. The motor is also housed in a lightweight, corrosion-resistant aluminum box but the base can become rusty. This can be easily remedied by painting the base. The ALEKO® AR1450 Slide Gate Opener is another sliding gate opener, but it has a higher capacity motor that is suitable for gates up to 55’ and 1,600 lbs. It is best known for its safety feature, which is to stop and reverse when it hits anything in its path. Although it has a good motor, you should note that it doesn’t include the gear tracks that are essential to this gate opener system. The ALEKO AS1200 Electric Gate Opener may not be used for sliding gates but is more suitable for swing gates, especially the mid-sized dual swing gates. It is affordable and very easy to install, especially by those who already have experience in installing other swing gate openers. If you have a long sliding gate, then the gate opener you should consider purchasing should be the ALEKO AC1400 electric sliding gate opener. This is the best sliding gate opener for those who are looking for something lightweight but it still has a heavy duty 1.5-HP motor, which can handle a gate that is up to 50’ in length and up to 1,400 lbs. in weight. With proper remote codes, it can give access to more than 100 remote controls, which makes it great for gates with multiple users. It is shipped in a 20.2” x 16.9” x 10.4” box and the total weight of the system is around 20 lbs. 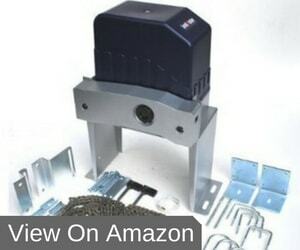 Included in the purchase are the sliding gate opener unit, the mounting metal base, other mounting hardware, wiring, 2 remote control openers, and the 20’ chain. It also includes a user manual but ALEKO gate opener troubleshooting is also available online through their website. There are also many users who claim that although the aluminum box doesn’t rust, the base of the box does rust, but this can be prevented by painting it before installation. If the ALEKO AC1400 is still not heavy duty enough for your gate, you’ll find the ALEKO AR1450 more suitable for your needs. It can be used on gates that have a length of up to 55’ and a weight of up to 1,600 lbs., which is makes it an ideal gate opener for commercial property. 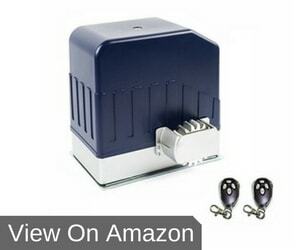 The low price range makes it a very attractive heavy-duty sliding gate opener. The smooth opening and closing motion make you feel that the gate is really secure and safe. The safety feature, which stops the gate and reverses it when there is something in its path, helps prevent crushing accidents due to the heavy gate’s movements, but you have to buy the magnet sensors for this to work. 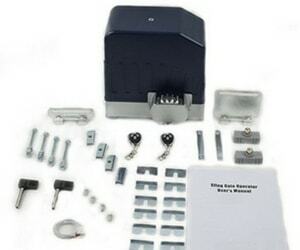 This product comes with the motor, the mounting accessories, and two remote controls. It is packed in a 13.4” x 13” x 10” box and weighs 20 lbs. One common rant that consumers have about this gate opener is that the instructions it comes with are not very helpful and are very confusing to follow. This leaves the customers no choice but hire professionals to install it or purchase another product. Once installation is complete, many find that it works smoothly in opening and closing, even if the gate is big and heavy. Do you have a dual leaf swing-type gate that is not too big and also not too small? The ALEKO AS1200 Electric Gate Opener is a good choice when your gate has a length of up to 10’ and a weight of up to 660 lbs. per leaf. This is made to accommodate mid-sized gates. Having a perfect size helps prevent performance issues due to poor choice of gate openers regarding size. This product includes the control box, two gate openers (one for each leaf), an instructional DVD, instruction sheet, remote control and mounting accessories. It comes packed in an 18” x 7” x 35” box that weighs 28 lbs. Additional accessories such as a wireless keypad, push button, batter, and solar panels may all be purchased separately and added to this unit for more convenience. The ALEKO swing gate opener manual is also available on their website in case you lose yours. According to many of the ALEKO swing gate opener customer reviews we’ve read, this is very easy to install, especially if you already had experience in installing other swing gate openers. Other ALEKO dual swing gate opener reviews also say that it is very affordable but warranty and customer service is very disappointing. Have you found that the ALEKO company as a good producer of various gate opener models? If you read ALEKO product reviews about the different gate openers, you will discover that there are many models.In order to get the most out of your purchase, you should carefully choose which model is well suited for your needs. Here are a few tips. Next, is to determine how often the gate opens and closes. Do you only drive through it once or multiple times in a day, or are there other vehicles that go through that gate in a day? Take note of the special features of the gate opener that you wish to experience. Are there locks that can be added to the gate opener system or can it be used with solar panels? If you have experienced getting in and out of your car just to open and close the gate, you will know how convenient it is to be able to open your gate without leaving your car. Gate openers offer that convenience and protection from various weather conditions.Gate openers also add security to your property because these can’t be opened by unauthorized access. These only open with the use of the remote control included in the system, or in some models, a numeric keypad that you press in the provided code. It also adds security by keeping you safe inside the vehicle when you arrive home late at night. There is no need to get out of your vehicle and risk getting mugged by criminals. The gate openers also come in various designs and some are made small enough not to be easily noticed. Once properly installed and working, it can also increase the value of your property. Of the three products, you have read about in this ALEKO gate opener review, we’d say that the ALEKO AS1200 gate opener is the best if you have mid-sized dual swing gates. The other two are great, but they can only be used for sliding gates. Although all the three can be used with additional accessories, this one is the easiest to install and set up. The appearance of the gate opener itself doesn’t negatively affect the appearance of your gate. 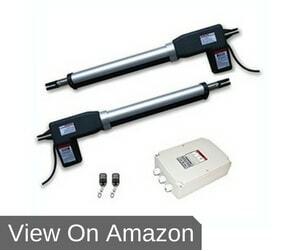 We also agree with other ALEKO swing gate opener reviews that point out how cheap it is. For the price, it is a good buy because it functions as it should, although we would love it even more if it had better speed.